"Francis? I mean, who's named Francis? A talking mule?" I became aware of Rob Zombie, as I think most people of my generation did, when his band White Zombie's video for "Thunder Kiss 65" appeared on Beavis & Butthead. Like most other people, I wrote him off as a novelty musician, but then his career took a strange turn when he directed House of 1000 Corpses in 2003. While I didn't love that film, I recognized that he was very savvy behind the camera, and clearly knew what he was doing as a director. His follow-up film, The Devil's Rejects, was one of my favorite movies of the decade, combining a love for the gritty exploitation films of the 70s with an uncanny ability to combine music and images. The Lords of Salem is set in the town of Salem, Massachusetts, famous for it's late 17th century witch trials. The film exploits this connection, and although it's set in modern times, never feels like it's fully disconnected from that dark past. Heidi (Sheri Moon Zombie) is a dj at a local Salem radio station who, one day, receives a strange record album housed in an old wooden box containing no labels other than that it's by "The Lords." When she plays it on her home stereo, it causes her to have sudden visions of a coven of witches being burned alive. When fellow dj Herman (Jeffrey Daniel Phillips) suggests playing it on their show, it seems to have a strange effect on the women in town that hear it. A Salem witch scholar (Bruce Davison) is intrigued by the music and begins investigating its origin. Simultaneously, Heidi finds herself experiencing strange visions and occurrences after a strange encounter with her landlord (Judy Geeson) and her sisters (Patricia Quinn & Dee Wallace). Is she going insane, relapsing into her old drug habits, or is there something more sinister going on in her life? The most immediate thing that I was taken with by The Lords of Salem is that it plays, strangely, more like an art house film than a standard horror film. Zombie's influences range from Georges Melies (photos from A Trip to the Moon hang all over Heidi's apartment) to David Lynch. In fact, this film feels more like a David Lynch film than anything else. If it weren't for the constant references to Satan, you might have been able to convince me that Lynch directed it. The film is slow and methodical, but never boring. It plays out like a fever dream, and is disorienting enough that you can never be sure if you're watching reality, a hallucination, a flashback, or some combination of the three. Zombie's use of music has never been better than it is here. While he'll likely never top his use of "Free Bird" at the end of The Devil's Rejects, he uses everything from Mozart's "Requiem" to Nico's "All Tomorrow's Parties" to amazing effect in this film. The film's score by John 5 & Griffin Boice is fantastic, but its Zombie's use of recognizable music with eerie imagery that makes the film so unsettling. It's also worth noting how well he uses silence too, since some of my favorite moments in the film where when everything went silent. The film is a true feast for both the eyes and ears. Another thing that Zombie does incredibly well is his use of actors and casting. Rocky Horror fans will delight at the appearance of Patricia Quinn, but film fans of the 60s and 70s will also find tons of great bit parts from people like Geeson, Wallace, Ken Foree, Michael Berryman, Maria Conchita Alonso, Richard Fancy, & Meg Foster. I was sad to see that Bill Moseley was not in the film, as he was a force of nature in some of Zombie's previous films, but keep your eyes peeled for a brief cameo from Sid Haig. I fully admit to dreading him casting his wife again, but she's surprisingly good in the film. Her scenes with Phillips are very good, which isn't surprising since he looks so much like Rob Zombie himself. Don't find yourself turned off to the film just because she's the lead, she will definitely surprise you. The film's photography by Brandon Trost is very good as well, and very well subdued considering he's worked with Neveldine & Taylor on all of their films, but the film is very well shot. The most important thing that I can say about The Lords of Salem though is this: If you're not a fan of Rob Zombie, this film will likely not appeal to you. There were several walkouts in the screening I attended, and it's most assuredly not a film for everyone. On the flip side of that, however, if you've been on the fence about Zombie as a director, this film will reinforce the fact that he is an undeniably talented filmmaker. His composition is excellent, his imagery is beautifully grotesque, and his use of music is second to none in the horror genre. Just beware, this is his most "Rob Zombie" movie yet. 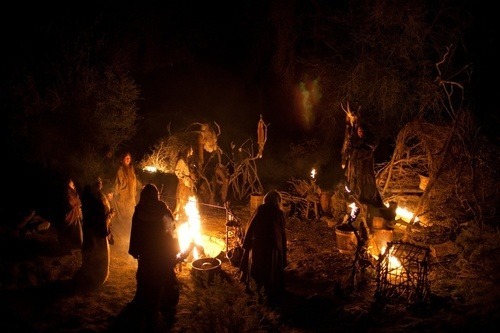 While it looks and feels like an art house film, it maintains a firm obsession with Satanism, witchcraft and blasphemy. If that's not your cup of tea, avoid it at all costs. If you are a fan, however, I cannot recommend it any higher. I thought the film was fantastic.